Every weight loss or weight gain programme talks about PROTEINS. They are the building blocks for growth and repair of muscle tissues of tendons, organs and skin. Proteins are made out of smaller molecules called amino acids which are linked together like beads on a string. Some of these amino acids can be produced by the body and are called non essential amino acids, while some cannot be produced by the body and we need to get them from our foods. These are called the essential amino acids. The protein requirement of each individual varies based on their intensity of workouts, medical conditions, height and ideal body weight. Before, we jump into the calculation of protein requirement, let’s first check out how to select the best protein out of the 3 major sources of proteins namely 1) Animal sources (chicken, fish, eggs, milk & milk products), 2) Plant sources (legumes, nuts, seeds and cereals) and 3) various Supplementary protein powders available in the market as protein shakes. This blog basically has two sections. acids required by our body. * Supplementary powders have most of the essential amino acids. Bio-availability represents the percentage of how much our bodies can make use of certain protein sources. Animal proteins have better bioavailability than plant proteins. Supplementary proteins have highest % of bioavailability. It is important to note here that at a go our body can absorb only 15 to 20 gms of protein. Note: Consult your trainer/nutritionist/doctor while calculating this protein amount as your medical conditions and intensity of workouts also need to be considered. To consume this amount of protein, we would want to divide this intake of protein into 5-6 meals over the course of the day. Managing this protein intake is a bit difficult for vegetarians. Even for individual who consume non-veg and take up heavy workouts, just the thought of eating six chicken breasts a day or eight egg whites in each meal can seem like a daunting task. An alternative to this is to ingest 1 or 2 scoops of protein powders in the form of a protein shake. Conclusion: Protein is not just about quantity. It’s also about quality. Protein intake needs to be wisely planned. Good sources of protein include high quality proteins like egg, chicken, fish, skimmed milk and soy. Red meat, egg yolk and high fat milk products are rich in saturated fats and hence should be avoided. Whole pulses, sprouts and daals(lentils) should be consumed in combination with a cereal to make the amino acid profile complete. For eg: Roti with Daal/Rice with Rajma/Khichadi. If required protein powders can be included. 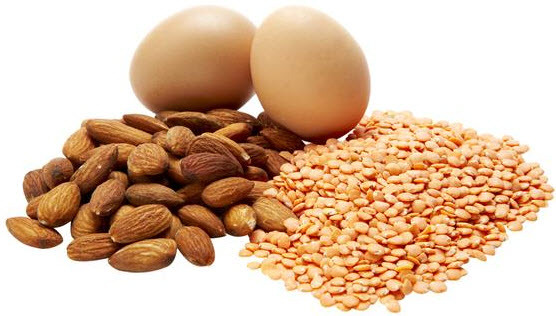 Natural source of protein is the best but, due to day to day constraints of making and eating them, you may need to add the protein supplement into your diet. Getting all your protein from powders is not the best idea, as it could potentially restrict your intake of vitamins and minerals from other foods. Selection of protein powder will be discussed in my next blog. Stay tuned!